This week’s blog entry was written by guest author Jenny Zenner. Jenny is a graduate of Whole Life Yoga’s teacher training program. She can be contacted at jzenner@gmail.com. I recently spoke on KUOW’s The Conversation with Ross Reynolds sharing my yoga injury story during William Broad’s appearance for his new book The Science of Yoga. His book and recent article “How Yoga Can Wreck Your Body“ have sparked a lot of discourse within the yoga community. As a journalist who suffered a significant injury in yoga, he’s played the publicity game well, getting the attention of many to challenge certain practices while shedding light on the true benefits available through yoga. As someone who was dropped on their head like a pogo stick in an advanced teacher training workshop, I hope that the ripple is wide, reaching a multitude of teachers and students to improve safety on the mat. My injury occured in spite of my training. I was at a studio where I was hoping to impress the owner by taking the advanced workshop to get added to the teaching schedule. Instead of engaging my own philosophy, I followed the instructions given, doing challenging backbends, doing an additional workout the morning of the second day to “warm up” and changing partners for each pose over the course of the two days. So it was under these conditons of being sore and fatigued, trying to impress and getting assisted by a complete stranger that I attempted a posture I’d never done before. The strong but slight woman was at least 15 years my senior. In retrospect, she had no hope of being able to successfully support me, and I had no business attempting the posture. Crumpled on the floor after getting released from the failed assist, tears welled in my eyes as I regrouped on my hands and knees, embarrassed and shocked. The owner stood by, recommended I work on getting my hips over my shoulders next time, and proceeded with the class. Fortunately I only sprained my neck and got a concussion, as the next levels of spinal chord severity are paralysis and death. I’m a safer teacher as a result. I don’t teach risky postures to strangers in group classes. I didn’t have the courage to challenge the workshop teacher even though I was a certified instructor myself. I can only wonder how many other students are embarking on risky postures taught out of tradition and pride. Alas in a recent class at a studio I was visiting, I heard a man in his 50’s gushing about a training he’d done over the weekend where they’d done Crow to Handstand, the very act that led to my concussion and sprained cervical spine, an injury that impacts me to this day 4 1/2 years since it happened. Looking at him, I wondered under what circumstances he found the need to do such an acrobatic posture. Thus I am compelled to continue the conversation by inviting fellow teachers, trainees and students to explore with me the risks of postures like headstand, plow, locust and transitions to wheel. Join Tracy Weber and me for Prose+Pose™ at 7pm on June 21st at 5focus to question, defend, and learn. Tracy is the founder of Whole Life Yoga in the viniyoga tradition, grounded in the philosophy of tailoring practices to individuals with safety at the forefront. She will discuss what led her to viniyoga and the foundations of her teacher training program. I will lead a discussion on the sections of William Broad’s book addressing risky postures and opportunities for more rigorous training of yoga teachers. This entry was posted in Asana, Guest Writers, Teacher Training Graduate Stories, Teaching Yoga on May 28, 2012 by Tracy Weber. 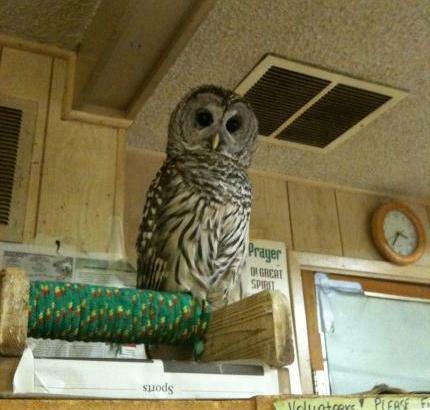 This barred owl stood sentry as the wildlife rehabilitator helped the studio's fallen pigeon. I expected to do lots of things when I opened my studio, but rescuing injured wildlife wasn’t one of them. Today provided just that challenge. It was the last thing I wanted, but just what I needed. You see two days ago, I lost my 16-year-old cat. Devil-cat earned her name. Marc and I rescued her as a wild kitten on our honeymoon. She spent most of her 16 years with us completely feral, even though she lived inside as a house cat. She hissed, scratched, and did bodily damage to anyone who tried to touch her. In fact, no one could pet her without fear of hemorrhaging. All until this past December, when she had what appeared to be a stroke and magically changed, becoming suddenly friendly and loving, if somewhat off-kilter. Her transformation made her death two days ago that much harder. After all, I’d just started to really get to know her. Devil and I had just fallen in love. Just when I thought I couldn’t take another trauma, an instructor e-mailed me. An injured pigeon huddled outside the studio door. All I could think was “No God, please, not another death. I don’t think I can stand it.” I even considered ignoring the e-mail and hoping the problem would magically resolve itself. But I couldn’t. Instead, I went online and did some research. Armed with gloves, towels, a box and goggles, I set out to capture the wayward bird. But what would I do when I caught it? According to law, some animals aren’t worth saving, and pigeons are among them. Most wildlife rehab centers are prohibited from even trying. But fortunately Paws directed me to a lovely lady who has chosen to give up funding in order to help all animals, including my new feathered friend. That bird couldn’t fly, but man could it run. I’m sure I looked like an idiot chasing the winged beast around the studio parking lot, begging it to stop and assuring I meant it no harm. When I finally captured her, I placed her on a towel in my hole-punched box and took off for Snohomish, hoping she wouldn’t die en route. Over an hour and several wrong turns later, I pulled up at Second Chance Wildlife Center. Owls, crows, blue jays, pigeons—even a chicken—all recuperated in cages when we arrived. And she (my pigeon was a girl) was still alive. The victim of a hawk attack, she wouldn’t have made it much longer out in the world, but here at this facility she stands a very good chance. All because of a woman who dedicates her life to helping beings less fortunate than herself. What’s the yoga lesson in this? I guess first is to follow your dharma, your life work, just as this woman has done. Make your life meaningful. Stick by your principles. Help those less fortunate, even if it means giving up pleasures (or government funding) that would make your own life more comfortable. And know that, just as the Yoga Sutras say, when any being–no matter its species–suffers, we all suffer. Live with “active compassion” when you see suffering, and work as hard as you can to prevent similar suffering in the future. I still grieve the loss of my cat, but I hope my bird makes it. I think she will. And I’m grateful for the new hope she’s given me, even in the midst of my loss. This entry was posted in Yoga Philosophy on May 21, 2012 by Tracy Weber. To learn more about understanding cravings, and and eating for energy, join Kamala on June 3rd at 1pm at Whole life Yoga! This entry was posted in Guest Writers on May 14, 2012 by Tracy Weber. Today’s post is written by guest writer Jasmine Kaloudis, who teaches yoga in Philadelphia and who is now, after 15 years of practice, is finding herself drawn to the wonderful tradition of viniyoga. She can be reached at info@synergybyjasmine.com. I just got back from my first Viniyoga training with Gary Kraftsow at the NYC Yoga Journal conference last weekend. I’ve been practicing hatha yoga for over 15 years and have mostly gone to classes that just had a bunch of sun salutations in them. Yoga has been a way for me to release tension and tightness but I think I was not trained in proper alignment and anatomy and after doing thousands of up-dogs, down-dogs, shoulder-stands and warrior poses without proper body mechanics, I have a feeling I injured my body pretty badly. I’ve had chronic neck stiffness and headaches for many years now and the last year my knees have been pretty bad. I was starting to dread yoga teaching so much since I would have to ice my knees after my classes and I would not be able to sleep due to my screaming knees. Imagine having someone whack you on your head with a sledgehammer all day long and just about every day. Now imagine someone is sticking a little knife at the back of your neck. Welcome to my body. I used to want to run away from my body but there was no where to run to. Deep sleep provided the only vacation from my body. I used to hate waking up in the morning since I had to wake up to my neck and forehead screaming at me. I am not sure if I had ever heard of Gary before this weekend. I think his name was familiar to me from Yoga Journal. I remember reading once about Viniyoga but whatever I read didn’t grab me and I was never interested in exploring it any further. I went to his first workshop on upper body, neck and shoulder pain. We did some unusual yoga poses that were similar to other poses I had done before but there were key differences. Gary kept emphasizing coordinating our breath to our movement, (otherwise it’s just calisthenics . We twisted, We triangled. We saluted and we warriored. After about 30 minutes of breath-centered poses, I slowly but deeply started to feel some relief. It would take hours for my body to integrate what we did and later I started to feel more relief. I was comfortable just being in my body. I felt present. I felt at home. I didn’t want to run away from myself or my body. I went to Gary’s all day intensive even though the title sounded uninspired. “Yoga for Depression and Anxiety.” We dove deeper into some of the physical and emotional mechanisms behind anxiety and depression. We explored chanting and breath centered movement. It was like a moving meditation. I could feel deeply ingrained patterns of limitation, pain and constraint being worked though levels of my fascia and psyche. I felt a sense of liberation. I was freed up to have new thoughts and new feelings. I taught some of these methodologies the next week in my beginner yoga classes and was delighted to see the look of relief on my students’ faces after I had introduced them to Viniyoga. I can’t wait to dive deeper into the warm waters of Viniyoga. Jasmine Kaloudis teaches beginner yoga in Philadelphia and is the author of the best spiritual websites list. She writes about yoga on her blog at http://www.synergybyjasmine.com/yoga-blog. This entry was posted in Guest Writers, Viniyoga on May 7, 2012 by Tracy Weber.